Nucleos, Inc. is a social impact company based in Santa Cruz and is focused on delivering a 21st century learning experience to students, in both underdeveloped and developed regions of the world. The company is targeting the education market with its PortableCloud product family, which addresses the challenges of schools with limited-to-zero internet connectivity and classroom bandwidth limitations. As former UN Secretary-General and Nobel Prize recipient Kofi Annan once said, “Education is a human right with immense power to transform. On its foundation rest the cornerstones of freedom, democracy and sustainable human development.” Yet students without access to digital learning tools are at a significant educational disadvantage. Of the approximately 1.4 billion students worldwide, close to 250 million students lack basic literacy and numeracy skills despite attending school. World-class education technology requires three key ingredients: internet connectivity, effective learning content and trained educators. 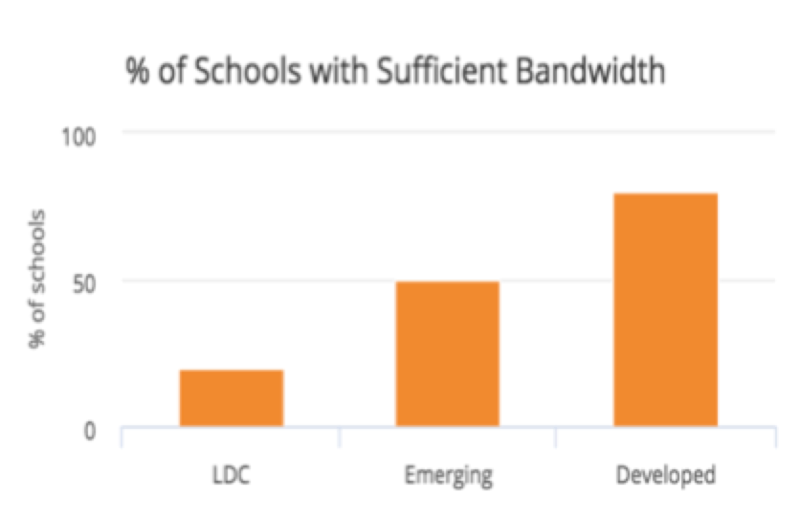 The graph in Figure 1 highlights the large disparity of school internet and bandwidth adequacy, illustrating what is commonly described as the “digital divide.” Students and educators in the advanced economies have already seen how the abundance of online education applications has enabled an “online, anytime, anywhere” learning opportunity – contrasted with students in Least Developed Countries (LDC) and emerging markets, where schools are continuously struggling to deliver successful learning outcomes using outdated materials (textbooks) and methods. There has been explosive growth in new applications – fueled by a rapid increase in VC-backed companies, with 2016 investments in the educational technology sector of over $2 billion for more than 400 companies. The promise of local cloud technology is finally coming true with significant improvements in wireless internet performance; the 802.11ac WiFi standard is over 1000X faster than when the initial version of the standard was first introduced in the late 1990s. The student population in LDC and Emerging markets has been growing rapidly, as governments focus on improving the general well-being and economic development of their citizens. Nucleos intends to revolutionize information delivery by lowering the technical and financial barriers to implementing local cloud solutions for education. 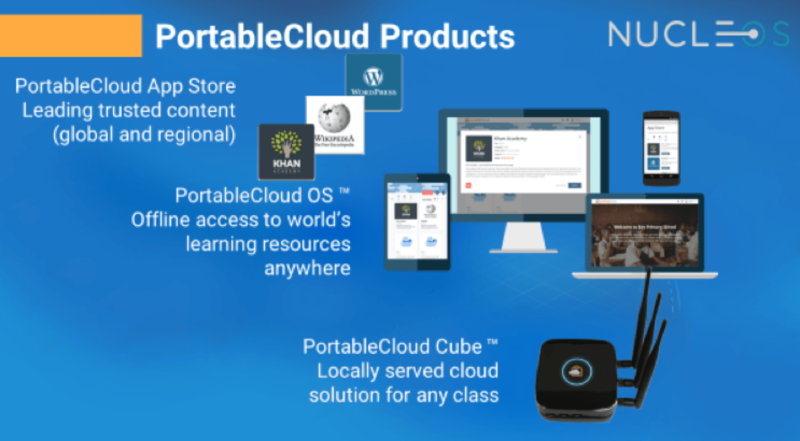 Included in the company’s PortableCloud product offering, depicted in Figure 2, is an app store, with both open-source and licensed content, an operating system to enable offline access to the world’s learning resources and the Cube, enabling a locally served cloud solution for classrooms. The company’s first deployments of the PortableCloud product family have reached over 2,000 students in 11 schools in Zimbabwe, including the Zimbiru Secondary School. Key to their successful deployment is the fact that there is continuous learning without internet connectivity, combined with the easy installation and easy access to the pre-loaded “Rizivu,” the locally sourced educational app used in the classrooms. Nucleos is located in the Pleasure Point area of Santa Cruz. The company is currently looking to raise additional seed funding, to expand product development efforts and to establish sales channel partners, both domestically and internationally. Noah Freedman – CEO, Co-founder. Noah previously founded 3rd Eye Labs, a software consulting company. He is an experienced program developer with 10 years of experience working in micro-server technology projects for the Stanford Graduate School of Education. He holds a degree in international development from Woodrow Wilson School at Princeton University. Camila Vega – COO, Co-founder. Camila previously worked for University of California’s SCOUT – a K12 online education program, where she helped develop a state-wide outreach & scholarship development program and secured $4M in funding. She is a University of California graduate, where she conducted cognitive science research on learning systems. Richard Curtin – VP Sales and Marketing, Co-founder. Richard is a marketing and business development executive with 20+ years of world-wide management experience, spanning roles at early-stage high-tech ventures through to large public companies. Most recently he was a GM with P&L responsibility for a $200M product line at NXP Semiconductors. He holds an MBA from Pepperdine, M.S. EE from Cornell and, B.S. Computer Engineering from Boston University and has been issued 2 US patents.